It wasn’t until I left my hometown, Winter Park, and traveled abroad that I realized how special it is to have a street like Park Avenue in a community. Park Avenue embodies one of Europe’s most celebrated civic designs–the strolling promenade. Its cobblestoned streets and sprawling Central Park are beloved by all who amble along its sidewalks. With restaurants and cuisines to match its worldly vibe, Park Avenue is brimming with fresh food and local ingredients. The old oaks dripping in Spanish Moss shade the streets where you can dine al fresco most of the year. So for your next day date or date night, grab a croissant and explore Park Ave’s hidden courtyards, sip an espresso while sitting in its rose garden, or pick up a baguette and lounge on its open lawn. At the heart of Boca’s mission is freshly prepared farm-to-table-fare. They believe everyone benefits by using local ingredients from farmer, to chef, to diner. Check it out for happy hour, lunch, dinner, or brunch. If you’re looking for a chef-prepared meal without the hassle of dining out, try their $29 take home meal for two, available Mon-Friday from 4-9pm. Having watched a string of restaurants try and fail to make it in this location at the quieter end of Park Avenue, I’m pleased to finally see Garp & Fuss breaking the streak. This American gastropub has charm and character. You’ll be hard-pressed to find the perfect spot to dine within this five-roomed restaurant. There’s something for everyone on the menu whether it’s wings, burgers or salad. You’ll find all of your Thai favorites on the menu at Orchid Thai, like green curry and pad thai. Orchid Thai prides itself on house-made soy sauce, among other specialties like homemade coconut ice cream and a full gluten-free menu. Sit inside or outside at this elegant spot. This breakfast and lunch spot is ideal for a boozy brunch. No reservations allowed at this local favorite, so arrive early if you want a full stack of their raspberry lemon creme pancakes (which you do). Brunch cocktails like Bourbon Blackberry Lemonade and Blood Orange Mimosas are worth the out-the-door wait. This casual Italian restaurant has just the right vibe. Plants waterfall down its brick walls while breeze billows through the restaurant’s folding glass doors that open up to face Central Park. Prato’s menu celebrates the best in Italian cooking: fresh, simple ingredients. You can’t go wrong on the menu whether you’re in the mood for pasta or wood-fired pizza. Don’t leave without trying a their spin on the Aperol Spritz–the Italian Citrus: Finlandia Grapefruit Vodka, Aperol, House Made Lemonade, and Pomegranate Juice. If you’re looking for a Far East experience, head to Bosphorous for the best Anatolian cuisine in Central Florida. This Turkish restaurant has been on Park Avenue since 2004. It’s known for its enormous domed Lavash bread that entices hungry diners walking past its outdoor tables. A warm atmosphere and exquisite Turkish food make this a Park Avenue staple for an exotic date night. This little French bakery is a personal favorite. Their croissants are as flakey as those you’d find in Paris. After you’ve salivated over the bakery counter and picked up a few many items to go, grab a hot espresso or refreshing lemonade and wander over to Central Park to sit by the fountain and people watch while you eat. Your new Park Ave vegan and vegetarian staple, this plant-based eatery was cooked up by the same minds behind The Sanctum Cafe. You’ll find organic, farm-fresh plates here as well as organic coffee and freshly pressed juices. But beyond their veggie-based menu and farm-fresh ingredients is just “real damn good food.” Flavor reigns king here with items like cast iron mac and (cashew) cheese, or the wild burger with pickled fennel and eggplant-pepper chutney. This recently-opened wine bar is The Imperial’s third location in Central Florida; the others are located in Sanford and Ivanhoe Village. A furniture store by day and wine bar by night, the menu includes wines, beers, cocktails, and a food menu of bar snacks and lighter fare. This chain coffee spot exceeds the service and product of competitor Starbucks. You’ll find fine fair trade coffee here alongside farm-to-table breakfast and lunch. 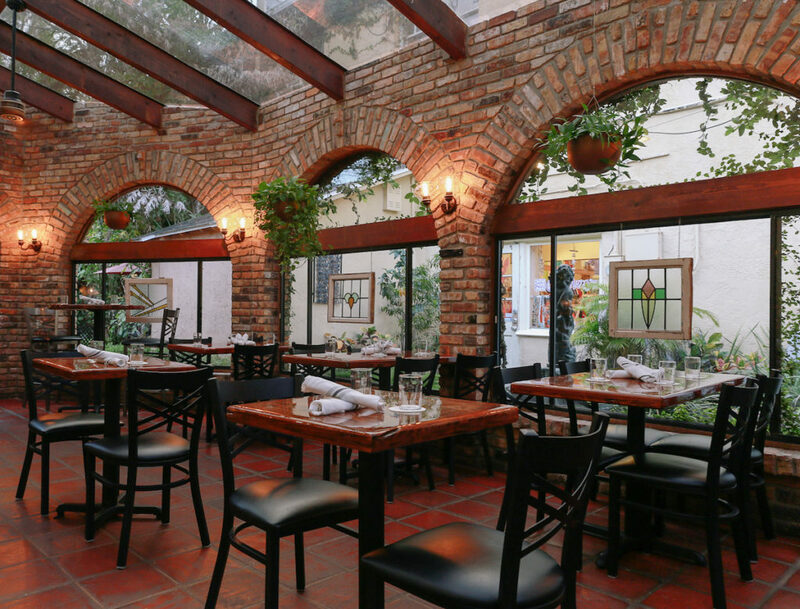 Great for a quick bite while people watching the Park Ave crowds, or for an intimate conversation in its secluded Mediterranean courtyard. This American fare restaurant boasts…wait for it…a park view of Central Park. Come here for happy hour ($1 off beer, and $5 select wines) and a hearty charcuterie board. Or, buy a whole bottle of wine and get a flatbread for free. Dine here for lunch, dinner, or brunch. For modern Tex Mex in an elegant setting, look no further than Cocina 214. You’ll find all of your favorite Mexican flavors and dishes here. With Cinco de Mayo fast approaching, you can’t miss indulging in their award-winning cocktail menu. Don’t miss their Elderflower Margarita, made with Elderflower liqueur, fresh raspberries, and lime. Just next to Luma, The Wine Room offers a unique way to sample many wines without a steep bill. Upon entering, you first purchase a refillable card that acts as your bartender for the night. Wander around and sample wines by using your card to swipe your way to a full glass. If you like a wine, simply swipe and order a full pour. Then, sink into the rich leather seating and get lost in conversation. An assortment of cheese and charcuterie, small plates, flatbreads and desserts offer perfect pairings. Put on your fanciest attire and head to Luma for an incredible meal in five-star environs. The modern American cuisine here is seasonally driven. You can find a list of their local suppliers on Luma’s website. Make reservations here for a five-course meal complemented by impeccable service. Or just stop by for a glass of wine while sitting outside and watching the crowds stroll by. No need to tell you where Peterbrooke is, just follow your nose. This European-style chocolate shop makes all of its chocolate in-house, along with eighteen flavors of gelato. All chocolate here is made from ethically sourced cocoa beans. Keep an eye on their Facebook page for fun special events, like the weekly Truffles & Bubbles date night and Wine, Cheese and Chocolate pairings in partnership with Quantum Leap Winery. Chef Chau Trinh and team have been serving up delightful sushi and Japanese eats in Oviedo for years, and devotees from Orlando have been making the trek accordingly. Now, the restaurant has opened a second location in Winter Park, just around the corner from Park Avenue on Lyman Ave. The Winter Park location has plenty of new and exclusive menu items as well as a weekly happy hour on Tuesday-Thursdays and Sundays from 4-6pm. Looking for a good New York style slice? Head to Park Ave Pizza, just off of Park Avenue on Lyman, for a quick bite. This Italian-American spot serves baked dishes, subs, and calzones as well. Comfort food at its finest, this local haunt has been around for a while and isn’t going anywhere soon. This French bistro and wine room has been a staple of Park Avenue for 37 years. In 2018, it was voted #1 French Restaurant by Orlando Magazine. Clearly this little French gem, like wine, only gets better with age. On the menu, you’ll find classic and authentic French dishes like beef bourguignon, as well as daily specials developed around what is fresh and in season. But what you can’t miss is the periodic wine pairing evenings–4 courses with 4 wines. Wines are hand-selected to pair delicately with chef specialties. Disclosure: Peterbrooke Chocolatier of Winter Park and Garp & Fuss are some of our valued advertising partners. You forgot about Panullos, the best Italian restaurant on Park Ave.